for my birthday cake this year, i wanted to bring a little piece of summer to the winter. 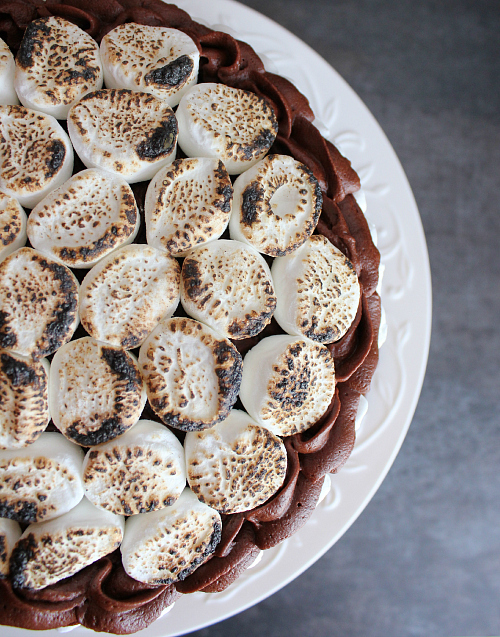 nothing screams summer like s'mores, so when we celebrated my birthday with our families over the weekend, ryan and i made a s'mores birthday cake for dessert! this cake was a labor of love, but boy was it worth it! we put our heads together and combined all of our ideas about how this cake should be constructed. the end result was a masterpiece. 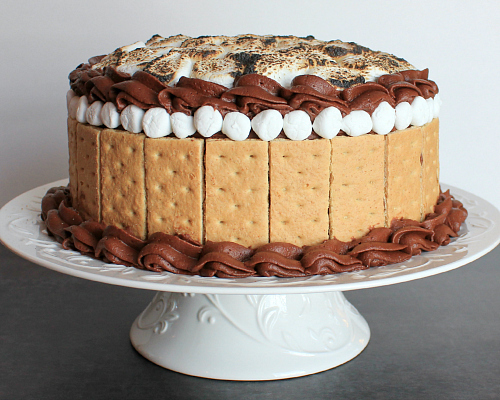 it was the perfect combination of chocolate, marshmallows, and graham crackers. 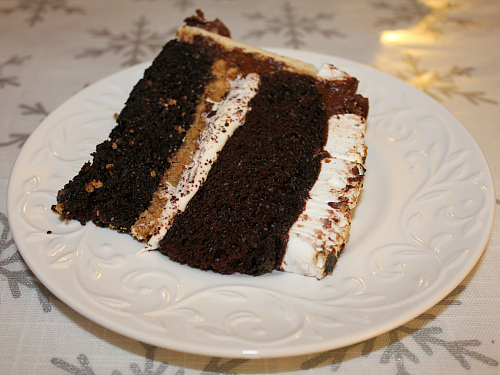 inside, marshmallow filling and a layer of graham cracker crust were sandwiched between two layers of chocolate cake . . .
outside, the entire cake was covered in fluffy chocolate buttercream frosting. for decoration, we lined the sides of the cake with graham cracker segments. then, we used mini marshmallows as a boarder around the outside of the cake too . . .
we covered the top of the cake with marshmallows, and we used our kitchen torch to toast the marshmallows . . .
as we torched the marshmallows, the entire kitchen started to smell just like s'mores around a campfire in the summertime. it was glorious. it made us forget all about the subzero temperatures that we have been having this winter. the cake was just like a giant s'more. it turned out great! to make the cake: preheat your oven to 350 degrees F. sift the dry ingredients into the bowl of an electric mixer. add all of the wet ingredients (except the coffee) and beat well until combined. stir in the hot coffee. the batter will be very thin. set aside. place the graham crackers in a ziploc bag and seal. use a rolling pin to crush the graham crackers into fine crumbs. pour the graham cracker crumbs into a bowl and mix with the melted butter. add more melted butter as needed, until all of the graham cracker crumbs are evenly wet. grease and flour the sides of two 9-inch round cake pans, and line the bottoms of the cake pans with parchment paper. pour the graham cracker crumbs into the bottom of one of the cake pans. press the crumbs firmly in the bottom of the pan with your hands. pour part of the cake batter over the graham cracker layer, and pour the remaining batter in the second cake pan until it is about 2/3 of the way full. (you will have leftover cake batter. you can bake off the rest of the batter in another cake pan or in smaller ramekins.) bake the cakes for 30-35 minutes, or until a knife inserted in the center of the cakes comes out clean. once baked, allow the cakes to cool in the cake pans for 10 minutes, then remove the cakes from the pans and allow them to cool completely on a wire cooling rack. to make the marshmallow filling: in the bowl of an electric mixer, cream the butter. add the vanilla extract and the marshmallow fluff. whip together, then gradually add the powdered sugar. add more powdered sugar as needed to reach your desired consistency. to make the chocolate frosting: in the bowl of an electric mixer, cream together the butter and cocoa powder. the mixture will be very thick. add the powdered sugar, vanilla, and milk. beat to incorporate. in a separate bowl, stir together the half-and-half and the ovaltine. pour the mixture into the frosting, and beat until incorporated. add more powdered sugar as needed to reach your desired consistency. to assemble the cake: place the cake that has the the graham cracker layer on a cake stand so that the graham cracker layer is facing up. pipe a ring of chocolate frosting around the outer top edge of the graham cracker layer. (this will help to insure that the marshmallow filling does not ooze out the sides.) evenly spread the marshmallow filling inside of the chocolate frosting boarder. place the cake in the refrigerator for 10-15 minutes to allow the marshmallow filling to harden up. place the second cake on top of the marshmallow filling. frost the entire cake with the chocolate buttercream frosting. place segments of graham crackers around the outside of the cake. cut several large marshmallows in half with a pair of kitchen scissors. 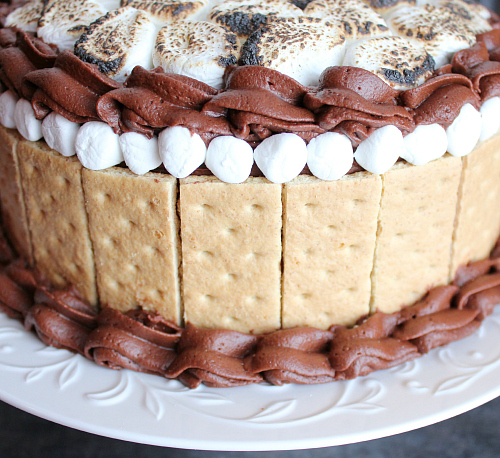 place the marshmallows, cut side down, on the top of the cake. use a kitchen torch to toast the marshmallows. cut several mini marshmallows in the same fashion and place them around the outside of the cake. The cake was very impressive to look at and very tasty as well. I saw an apron that matched the wrapping paper of the the cupcakes. Oh wow! Talk about decadent and wonderful! I just want to take a big bite haha! Visiting from the dessert challenge! Happy birthday! I am stopping by from the dessert challenge. I think your cake was my favorite! Nice work! :) I am hosting Family Fun Friday today...stop by and bring your cake! Blessings! What a fabulous cake! It's so beautiful. I'm so glad you participated in the Lady Behind the Curtain Dessert Challenge! HUGS! This is a gorgeous cake! So nicely done! Stopping by from the Dessert Challenge - pinning! What a gorgeous cake. I love smores also, and I see no reason not to eat them anytime! Stopping by from the Dessert Challenge. Thank you for bringing your cake to Family Fun Friday! It really is such a beautiful and creative cake! Pinning on our Party Board! OMGoodness! This cake looks crazy amazing! :) Pinned for sure. What a fun and gorgeous cake !! YUM!! I will now wipe the drool off my screen!! Thanks for sharing via Family Fun Friday. Deanna - I am a decaf coffee drinker, so I used decaf coffee in the cake. Since decaf coffee has a tendency to be weak, I used a full-bodied strong coffee. Looks great, Laurie! One question - I don't have a kitchen torch - would a oven broiler work just as well? Marissa, You could put the marshmallows on a baking sheet and put them under your oven broiler for a few minutes to toast them up before you put them on top of the cake. Be sure to watch them carefully so they do not burn!